Adding an additional service panel to your existing breaker box can be a convenience or a necessity. Adding an outside service panel with a dedicated breaker for an underground well pit or an air-conditioning unit makes their service convenient and safe. If you've run out of space for breakers in your existing panel and need to add another circuit, a sub-panel will be a necessity. In some areas, any electrical installation or repairs must be done by a qualified electrician and inspected once the work is complete. Check with your local code enforcement board before attempting any modification to your home's power supply. A subpanel can put control where you need it. Mount your new service panel. Consult local codes for acceptable mounting procedures and locations. Remove one of the panel's knockout plugs with a screwdriver. Thread your main supply wire through the hole. Strip 1 inch of insulation off of each of the three conducting wires with a utility knife. Secure the conductors in their proper positions inside the new panel. The black and red wires are the hot leads. Attach one to each of the terminal lugs on the new panel's main breaker. Attach the white lead to the neutral bus bar and the bare, ground wire to the panel's ground bar. Run the new wire to the existing service panel. Turn off the power in your existing service panel. Flip the main breaker to the off position. Remove the panel's cover plate to expose the bus bars and connectors. Turn your voltmeter on and check the voltage inside the panel. Place one lead on the neutral bus bar and the other lead on the hot bus bar. If the reading is zero, the main breaker is doing its job and power to the service panel is shut off. If the reading is anything but zero, stop. Contact an electrician or your power company. Do not attempt any work on this panel until the problem is resolved. Remove a knockout hole on the existing service panel and thread the new wire into the box. Cut the wire to length with wire cutters. All leads should be able to reach their connections with at least 2 inches of slack left. Strip 3/4 inch of insulation off all three colored leads. Loosen both terminals on your new circuit breaker and attach the black and red leads. Attach one lead to each of the breaker's terminals. Attach the white lead to the neutral bus bar. Attach the ground wire to your existing panel's ground bar. Snap the new breaker in place. Replace the cover on your existing panel and restore power at the main breaker. Check the voltage at your new service panel with a voltmeter. You should get a reading of between 240 and 220 volts. The main breakers in both sub-panels and main panels are supplied with 240-volt current. This is why a three-conductor wire is used to connect them. Significant voltage drop occurs over long distances. Consult your local codes for distance and wire gauge requirements. 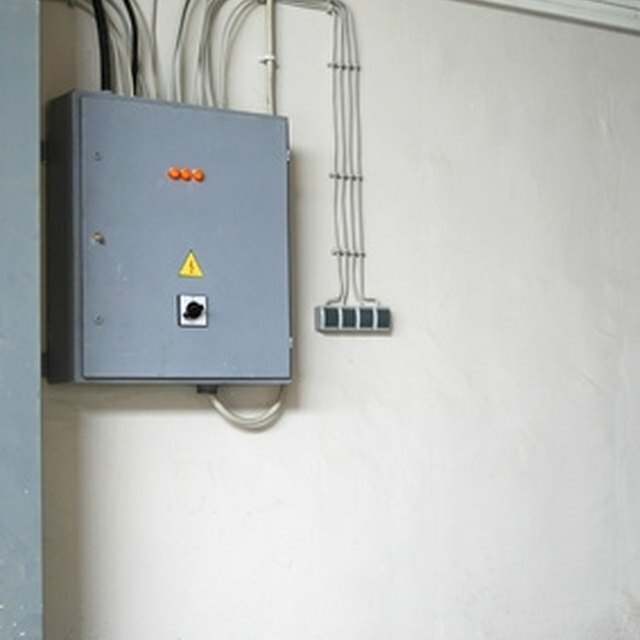 Improper wiring can result in injury, property damage or death.